Go retro this spring with our new retro easter wafer paper designs. Darling shapes featuring rabbits, chicks, sheep, duck and all their friends. Make your cookies shine with a sprinkle of edible glitter or a few edible pearls or dragees. Check out our Easter and Spring how-to recipe guides by clicking HERE. Hoppy Spring Baking Fancy Friends! 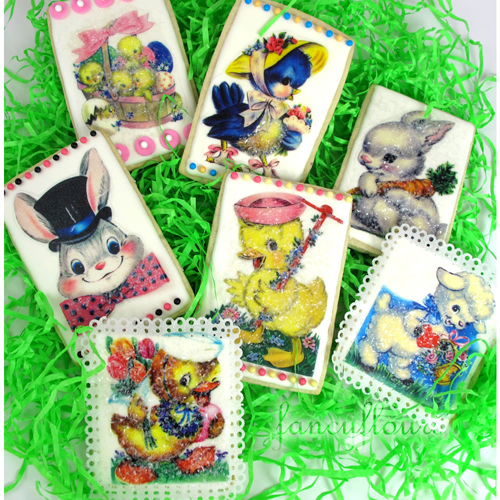 This entry was posted in Cookie Recipes & Ideas, Easter Treats, Spring Baking and tagged Easter Treats, fancy flours, retro, Spring Baking, sugar cookies, wafer paper by Fancy Flours. Bookmark the permalink.